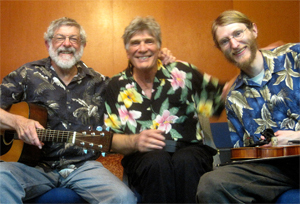 Riffraff features Lindon Toney and Jesse Partridge on twin fiddles, and Jay Finkelstein on guitar. 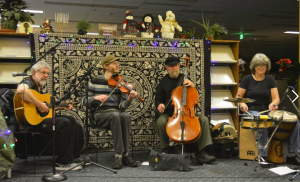 The band plays a high-energy assortment of traditional contra dance reels, jigs and marches from varying genres, with occasional original tunes from current or past band members. Plays @the Fourth Saturday Dance, all year. Cobbler features the fiddling of Olympia's Jesse Partridge, accompanied by Jay Finkelstein on guitar. The band's repertoire draws from Irish, Quebecois, southern old time and New England contra traditions. 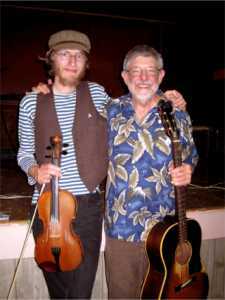 With Jesse's creative and exciting fiddling, accompanied by Jay's driving guitar rhythms, Cobbler provides a zesty and sweet confection of contra dance music as tasty as the dessert for which the band is named. The Riel Thing features the fiddling of Olympia's Jamie Fox, accompanied by Jay Finkelstein on guitar. Jamie grew up in Montana where she learned her craft from a local native fiddler. The band's primary musical style is Metis, the music that evolved from the merging of the French and Scottish fur trappers' fiddle tunes with the native drumming tradition of Western Canada and the NW US. Jamie's fiddling captures both the underlying driving drumming rhythms and the sweet flavor of the medicine tune tradition. 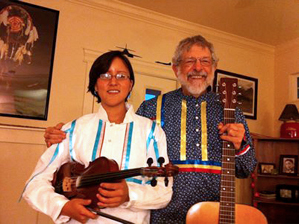 The Riel Thing is one of the very few contra dance bands that features this unique and exciting musical genre. The Contra Quartet consists of Olympia musicians Jesse Partridge (fiddle), Steven Cifka (cello), Julie Bennett (percussion) and Jay Finkelstein (guitar). Jesse is a fine, creative fiddler, as adept at playing harmonies as he is at playing lead; Steven is a concert cellist exploring what the cello can add to this musical genre; Julie finds interesting rhythmic riffs on a variety of drums that magically enhance the dance experience; and Jay's guitar glues the whole thing together. The Contra Quartet provides an exciting and powerful dance experience you won't soon forget. Olympia Volunteer String Band, directed by Jesse Partridge. Each year these talented musicians play at the May second Saturday dance as a gift to the dance community. This event is part of our annual fundraiser which includes a potluck and Silent Auction. Photos by Maddison Kay Photography.